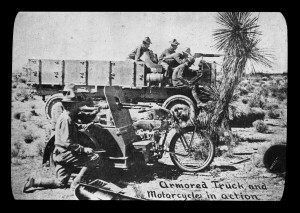 Armored truck and motorcycle in action, Pershing Mexican Expedition, New Mexico, 1916, by W.H. Horne. Palace of the Governors Photo Archives LS.1908. After Pancho Villa’s March 9, 1916, attack on Columbus, NM, Gen. John J. Pershing launched a Punitive Expedition with one goal: Get Villa. Given his failure to do so, Pershing’s effort could easily be chalked up as a military failure. But its long-term impact was significant. The surge into Mexico provided valuable training for Pershing and for New Mexico troops who would all too soon enter World War I. As centenary commemorations for “The Great War” begin across the globe, the History Museum’s interim director, Jon Hunner, will speak on “World War I and New Mexico” at noon on Wednesday, July 30. This free lecture will be in the Meem Community Room; enter through the museum’s Washington Avenue doors. Hunner is a New Mexico State University professor of history on loan to the museum. His areas of expertise include 20th-century New Mexico and the Manhattan Project. On June 28, 1914, Archduke Franz Ferdinand, heir to the Austro-Hungarian Empire, was assassinated in Sarajevo, along with his wife. A month later, Emperor Franz Joseph declared war on Serbia; Russia, Serbia’s ally, immediately mobilized its forces. By Aug. 1, Germany had declared war on Russia, and the dominoes began to fall. The United States entered the war on April 6, 1917. Armistice was achieved on “the eleventh hour of the eleventh day of the eleventh month” of 1918—today commemorated as Veteran’s Day. What roles did New Mexico play in the conflict and what impact did the war have on our state? What was the Zimmerman telegram and how did it speed America’s entry into the war? Hunner will explore how events in distant lands affected the New Mexicans who served, including the many men who gave their lives, and how those events transformed the nation’s second-youngest state. Who has the nation’s No. 1 Western museum? We do, we do! 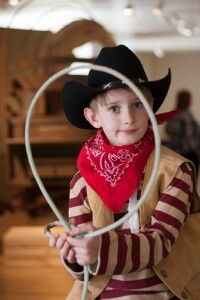 The honor follows the announcement that the museum won a national Award of Merit for Leadership in History from the American Association of State and Local History for its 2013–14 exhibit, Cowboys Real and Imagined. Upon its opening in May 2009, the museum was named “one to watch” by the magazine. In this, its fifth-anniversary year, the museum has two major exhibits featuring treasures from its collections: Painting the Divine: Images of Mary in the New World and Poetics of Light: Pinhole Photography. Spur Award-winning writer Johnny D. Boggs selected the winners for True West’s annual award based on his extensive travels, research and firsthand experiences in visiting dozens of Western museums each year. True West magazine is in its 61st year of leading the way in presenting the true stories of Old West adventure, history, culture and preservation. For subscriptions and more information, visit http://www.twmag.com or call 888-687-1881. Comments Off on Who has the nation’s No. 1 Western museum? We do, we do! NM History Museum News Blog is powered by Wordpress. Wordpress theme designed by Design Blog.